As with any kind of major work that needs to be done on your house, make sure you have qualified workers on the job. Ensure that you have an estimated start date and an end date for the work so the planning for the job can be efficient and effective. Clean up the yard by removing any item that might be in the way. Put away any potted plants, toys, bikes, patio furniture and barbecue grills. You want to ensure there is clear access to the yard for both materials and the eventual clean up. Don’t forget to cover your pool if you have one. Once the work is finished, check your yard for any damage or debris that might have been left behind in the cleanup. If you have bikes, cars or other vehicles make sure they are removed away from the drive or stored in the garage until the job is done. The workers will need a large space where they can keep the roofing materials and have easy access to them. In the garden itself make sure that any trees are trimmed and not hanging over the roof causing a hazard to the roofers. If you have, stored materials in the attic try to remove those items and store them in a different location. These could get damaged or covered in debris whilst the job is being done. Ensure that the workers have access to adequate power supplies and make sure that they have access to the fuses or circuit breakers in case they get tripped during the job. Keep children away from the work and the materials. All construction sites are a potential hazard to children. Make sure the workers leave a clean environment when they finish work for the day and that the area is cleaned up adequately to ensure safety of the entire household. The same goes for your pets, if they can’t deal with strangers working around the house it might be an idea to have someone look after them temporarily or arrange for a doggy daycare or pet sitter while the job is ongoing. Having a new roof installed can cause vibrations and it may be a very good idea to remove any precious artwork or items that could fall and break. Store valuable items that may be susceptible to any vibrations damage in a safe place. A new roof will cause dust and dirt in the house as the dust falls through heating, lighting and ventilation ducts. If your family suffers from dust allergies it might be an idea to invest in a good air cleaner to prevent any issues or at the very worst make sure those family members are not at home during the construction phase. Make sure your fire and carbon monoxide sensors have good batteries and are working properly. This is an extra safety precaution but roofing can disturb your heating systems and you don’t want to take that chance. Finally make sure your neighbours know you are getting a new roof, you don’t want to surprise them with a yard full of construction materials, workers and the attendant noise. They will greatly appreciate the heads up. 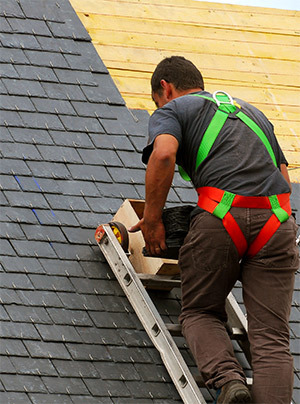 Call iRoofing Toronto at (416) 477-1070 if you have any questions about roofing, we are here to help.